28 Mar Are you a Big Picture or Detail Thinker? Do you work with someone who bores you to tears with detail upon detail that you don’t seem to need, and who appears to lose sight of the big picture or objectives? Are you frustrated by a colleague who operates from a vague, airy perspective and who doesn’t appear to know (or care) about the important details? Do you ever find yourself thinking that you are the only normal one and everyone around you is completely dysfunctional? There’s a reason we find ourselves feeling a bit like we are hitting our head up against a wall when we communicate with certain people. It’s that we are different to them! And the Big Picture/Detail Picture personality filter will help you better understand why your communication can sometimes be a bit ‘hit and miss’. Big Picture thinkers are deductive thinkers. They start with the global perspective and move downwards to the specifics. They operate from a universal perspective and tend to draw on the big picture or overall concept. These people may miss details so they also commonly leave out steps in a process. For instance, they may be excellent at managing different parts of a project, but may struggle to complete all the detailed steps within each part of the project. What is a Little Picture Thinker? Little Picture thinkers are inductive or specific thinkers. They start specifically with the details and move upwards. They operate from an in-depth perspective and tend to focus on the details or facts and figures. These people have trouble working in the midst of visual clutter. They like things put away in an organized system and they do things precisely and in order. What is your current approach? Whether you are communicating one to one, one to few, or one to many, if you are keen to influence your audience in your presentation, you need a model that focuses on the different needs and expectations of your different stakeholders. You see, individuals take in information differently, learn differently, and form opinions differently. As a result, individual stakeholders will be silently preoccupied by the different agendas and expectations they have of you. These agendas and expectations lead them to formulate certain questions that they are expecting you to address in your presentation. Let me share a model with you to help you achieve greater buy-in and to cater for the diverse needs of your stakeholders. If you are a Big Picture thinker and have to communicate with specific thinkers, it can be very frustrating because you are someone who wants to focus their attention on the strategic level (the WHY? And WHAT IF? ), preferring not to get bogged down with details (the WHAT?). On the other hand, the Little Picture thinker wants to give you the important details, they get stuck in the WHAT section of 4Mat, often rendering you entirely bamboozled. To build rapport with Little Picture thinkers give them lots of details and break information down into small chunks. Once they are on top of all the details, you will be able to explain the overall picture to them. Remember that if your customer, or employee has a specific preference they need a detailed presentation with facts, figures, details, charts and statistics in order to make a decision. If you are a Little Picture or specific thinker and you need to communicate with Big Picture Thinkers, it can be very confusing. Big Picture thinkers are people who start from general principles. They will present you with concepts and overall perspectives. They want the forest first, not the trees. You will improve your communication with these people by talking first about the overall concept and large ideas, spend more time in the WHY? section building rapport and proving the need. Avoid going into detail (the WHAT?) until you have built good rapport. And always remember that if your customer has a global preference they need shorter, more conceptual presentations and pitches. Where do you sit on the continuum? 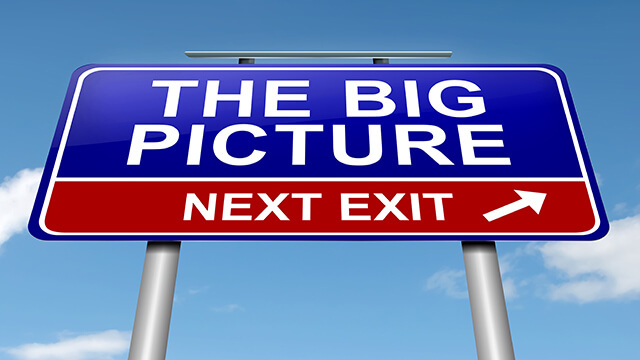 It’s important to note that most people do not neatly operate consistently as either Big Picture or Little Picture. They tend to operate somewhere on the continuum, and the demands of a position will also have some impact on the degree to which people operate as Big Picture or Little Picture thinkers in their day-to-day working lives. It’s certainly important not to box or label people inappropriately. Go forth and flex your style! Switched-on business people who are keen to accelerate their career or business development have high emotional intelligence. They can intuit their environment and make clever, masterful choices about why and how to act in certain ways, whilst preserving the integrity of the people with whom they interact. They know how to interpret the verbal and non-verbal clues that people provide about their filters or preferences. Then they can match their approach to the needs of their stakeholders. It’s really all about a keenness to ‘flex’ your style. Do this and you will build strong rapport with people and have great success in your life. So, enjoy getting to know the people around you. Celebrate your sameness and differences and achieve the most from your relationships. You don’t have to change the world with your actions, just take personal responsibility for the decisions you make and they way you chose to treat the people around you every day. If we all did that it would be a better world. The people around you aren’t dysfunctional, just different to you!